Organic farming is a form of agriculture that relies on techniques such as crop rotation, green manure, compost, and biological pest control. Organic agriculture is an ecological production management system that promotes and enhances biodiversity, biological cycles and soil biological activity. Organic farming is involved with the natural methods like crop rotation, biological pest control, compost etc. It is based on minimal use of off-farm inputs and on management practices that restore, maintain and enhance ecological harmony. Organic farming is a concept with stringent guidelines for certification. There are a number of techniques that are well suited for organic cropping. In organic farming farmers are required to use traditional farming techniques along with relevant technology to help get enough produce and ease the process. The techniques are based on biological processes and usually come under the field of agro ecology. There are a number of websites that help the farmers in understanding different farming techniques. Several environmentalists and consumer protection organization have claimed that the use of synthetic pesticides not only damages the environment but also have an adverse impact on the quality of food. Pests and insects easily get adapted to the effects of the chemicals involved in them and so these pesticides lose their worth. Sooner or later it damages the health of the final consumer who unknowingly consumes a large amount of lethal chemicals and synthesized materials along with the natural food. You can make use of organic farming to turn your dreams of safe and wholesome food into reality and the best part is it is already benefiting millions of people. The policy makers are also promoting organic farming for reasons like – sustaining rural economy, improving soil health, creating good environment etc. In India, organic farming has been in practice for decades. Organic farming is of great importance and there are a number of benefits of organic farming. The food items that are grown by the methods of organic farming are tasty, wholesome and healthier. In the conservative farming, many pesticides and fertilizers are used to protect the crop. There are many pesticides that are highly dangerous for humans. In organic farming, the usage of pesticides is very limited and hence, people who consume the food items produced from organic farming are at low risk. Organic farming relies on the breakdown of soil management. Different techniques are used to preserve the nutrients that are taken by the previous crops. Organic farming is very cost effective compared to the conservative farming. Moreover, this farming is not very tiresome, time taking or difficult. The field trials were conducted with soybean (variety JS 9560) on six farmer’s fields (one farmer in one district). Necessary plant protection and intercultural operations were done as per package of practices of the crop. Sowing was done at farmer’s field with recommended seeds and fertilizers (seed rate -80 kg ha-1, N-20, P2O5-60, K2O-20 and S-30 kg ha-1) during kharif season 2014 at farmers field on black clay soils classified typic Ustochrept of Vindhya Plateau of Madhya Pradesh to study the Effect of Integrated Nutrient Management on yield attributes, seed and straw yield, economics and total nutrient uptake of soybean. The experimental soil belongs to order Vertisoils with low ECe 0.26 dSm-1 and neutral pH of 7.58. The available nitrogen, phosphorus and potassium content of the soil were 180 N,13 P2O5 and 460 K2O kg ha-1, respectively. The treatment T6 i.e. application of RDF + 5 t ha-1 cow dung (sources N-urea, P-rock phosphate, K-feldspar, S-gypsum) significantly increased most of the attributes and seed and straw yields of soybean as compared to control (T1 RDF) (sources N-urea, P-rock phosphate, K-feldspar, S-gypsum and no cow dung). Plant height increased 9.67 % more (40.30 cm) in T6 as compared to T1.The plant height of 36.40 cm was noticed in case of T1. Maximum dry matter/plant, pods/plant, seed index, harvest index and straw yield (kg ha-1) were found maximum in treatment T6 as compared to other treatments under study (Table-1). The maximum grain yield (725 kg ha-1) was recorded in treatment T6 which was over 19.8, 14.2, 8.7, 4.3 and 2.5 percent more as compared to T1, T2 (RDF + 1 t ha-1 cow dung), T3 (RDF + 2 t ha-1 cow dung), T4 (RDF + 3 t ha-1 cow dung) and T5 (RDF + 4 t ha-1 cow dung) respectively. The highest net returns Rs 21327 / ha and Benefit: Cost ratio (1.94) was obtained with treatment T6. Table – 1. 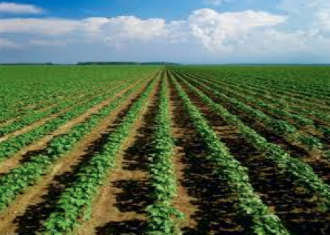 Effect of gypsum and its mixture with low grade rock phosphate, feldsphar, and cow dung on yield attributes and yields of soybean crop. This entry was posted	on Thursday, June 16th, 2016 at 5:20 pm	and is filed under Uncategorized. You can follow any responses to this entry through the RSS 2.0 feed. You can leave a response, or trackback from your own site.